Now that summer is officially here, the Ontario Genealogical Society Toronto Branch volunteer crew will be out transcribing gravestone inscriptions on Wednesday evenings from 5:30 to 8:00 pm and Saturday mornings from 9:00 am to noon. It is a huge job to preserve the information and make it available for researchers everywhere. We could really use your help. As you can see from the photo, it is a collaborative process. We work in groups—to locate the plots according to the map and the notes we’ve made from plot records, to find and uncover any markers that have been overgrown with sod, and to read and write down the inscription. We frequently muster the full crew to decipher a particularly puzzling phrase or verse. What do you need to bring? A pair of gardening gloves would be handy, but we’ll supply everything else. Come dressed for the weather, with sunscreen, hat, drinking water, and perhaps insect repellent. Sensible shoes for uneven ground are in order. 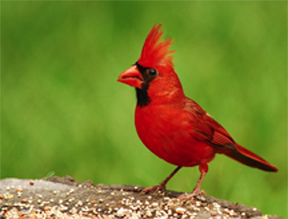 St. James, on the edge of the Don River valley is a haven for birds so you might want your camera, too. The crew will be out just about every Saturday and Wednesday from now until the fall, weather permitting. Please contact us at info@torontofamilyhistory.org to confirm. At this point we are working in Section A p.s. (along Parliament Street), but we’ll also confirm that location when you get in touch. St. James Cemetery is on Parliament Street just south of Bloor, and easily reached on the #65 bus which runs between Castle Frank subway station and Front Street. The #94 Wellesley bus which runs between Wellesley subway station and Castle Frank station will also work. (Either route, get off at the Wellesley and Parliament stop.) Drivers can park on cemetery roadways. There’s a map of the sections just inside the gate. Please join us. It is a very enjoyable way to spend a few hours! 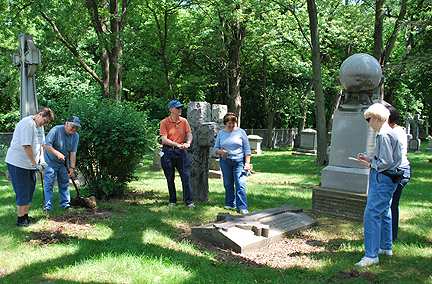 The Ontario Genealogical Society Toronto Branch crew transcribing gravestone inscriptions at St. James Cemetery in Toronto on June 18, 2011. The Toronto Branch of the Ontario Genealogical Society celebrated the completion of a 20-year project in March 2011 with the publication of the transcription of grave markers at St. John’s Norway Cemetery and Crematorium. St. John’s Norway Cemetery, also known as St. John the Baptist Norway Cemetery or St. John’s Cemetery, Berkeley, was originally established as an Anglican churchyard in 1853 on three acres of land donated by Charles Coxwell Small. (The community was known as Norway or Berkeley at various times.) The first recorded burial in the cemetery was that of William Dawes, a local farmer, who died on 19 July 1854. The cemetery was consecrated by Bishop John Strachan in July 1855. 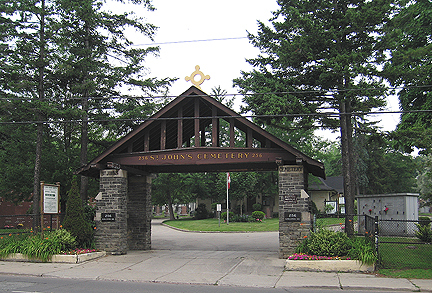 It is now inter-denominational, and its grounds have expanded over the past century and a half to cover about 35 acres of land at the northwest corner of Kingston Road and Woodbine Avenue in Toronto’s east end. The transcription of this cemetery was a massive project that took two decades to complete and involved dozens of dedicated volunteers. The project was headed up by Branch Cemeteries Co-ordinator Jack Tyson, who obtained the necessary approvals, handled the paperwork and logistics, and organized teams of transcribers, inputters, indexers, proofreaders and editors. The field work for the project took place at the cemetery itself. Transcribers set out week after week, typically in pairs, equipped with spray bottles of water, probes and digging tools, and went up and down the rows of tombstones, carefully recording what they found on each one. They handed over their notes to be typed up by computer inputters, and then made two more full sweeps of the cemetery to check and update the computer printouts. All the data was indexed, proofread and redacted several times. Final proofreading and editing was done by Jeannette Tyson. For more information about this project or how to help with ongoing transcribing of Toronto cemeteries, contact torontocemeteries@ogs.on.ca.